Rutgers-Camden has been on the wrong end of Rowan women’s basketball history lately. When the two teams met on Dec. 3, 2014, Rowan emerged victorious with its sixth straight win out of the starting gate. 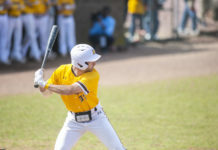 Almost one year later exactly, Rowan faced its New Jersey Athletic Conference rival with an identical streak on the line. Once again, the brown and gold got their way. For the second-consecutive season and only the third time since 2000-01, Rowan has opened the season with six straight wins. Last season, the Profs nabbed their first eight games before suffering a 76-71 defeat to Widener University. Having an experienced team that features two juniors and three graduate students in the starting lineup has proven to be an edge for Rowan. That focus was evident in the team’s last three games against Immaculata University and NJAC foes Stockton University and Rutgers-Camden. On Nov. 21, Rowan led Immaculata by 25 at the halfway mark, and ended up defeating the Mighty Macs by 40 as part of a 99-59 rout. Against Stockton three days later, the Profs needed overtime but managed to outscore the Ospreys 17-9 in the quarter to win 97-89 and secure their first conference win of the 2015-16 season. Rowan followed up holiday break with another NJAC victory coming over Rutgers-Camden on Wednesday night. Leading the Profs against the Ospreys in the NJAC opener was graduate student forward Kate Matthews, who registered her third double-double of the season with 23 points and 14 rebounds. Three other Rowan players scored in double figures. Sanchez and graduate student guard Kaitlin Schullstrom paced the brown and gold past the Scarlet Raptors, combining for almost half of the team’s scoring (31 points). Guards Summer Crilley and Ashanti Bishop contributed nine points each off the bench. Bishop also pulled down six offensive boards. On the season, three out of the five players in the starting lineup are averaging more than 10 points per game—Sanchez, Matthews and Schullstrom. It could be argued that veteran experience or their multiple scoring options have helped the Profs get out to a 6-0 (2-0 in conference) start, however Sanchez attributes the team’s success to something else.